"The intricate shape of a single arm is determined by the ever-changing conditions experienced by the crystal as it falls. Because each arm experiences the same conditions, however, the arms tend to look alike. The end result is a large-scale, complex, six-fold symmetric snow crystal. And since snow crystals all follow slightly different paths through the clouds, individual crystals all tend to all look different." What exactly is an ice crystal? A crystal is a material for which the molecules inside are all lined up in a specific way called the crystal lattice. 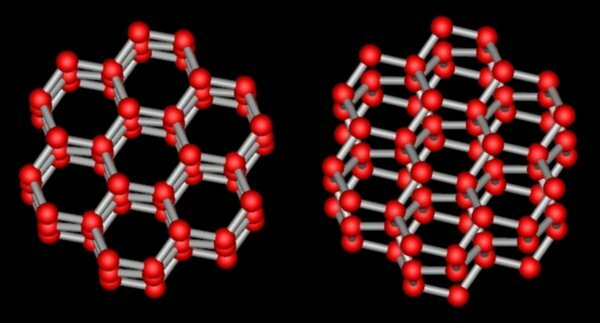 The water molecules in ice form a hexagonal lattice as shown at right (two views of the same thing). Each red ball represents an oxygen atom, and the grey sticks represent hydrogen atoms. There are two hydrogens for each oxygen, making the usual H2O. Why do snow crystals form in such complex symmetrical shapes? Why are snow crystals six-fold symmetric? The hexagonal symmetry of snowflakes originates with the underlying symmetry of the ice crystal lattice. 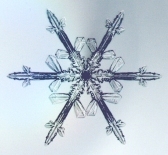 Water molecules hook up in a hexagonal lattice (see the Snowflake Primer), and the molecular symmetry is imparted to the snow crystal form via faceting (see Crystal Faceting for more on how this works). In particular, tiny snow crystals are usually in the form of small hexagonal prisms (see the Snowflake Primer), which is how the six-fold symmetry of snowflakes gets its start. Why do snow crystals have such complex shapes? 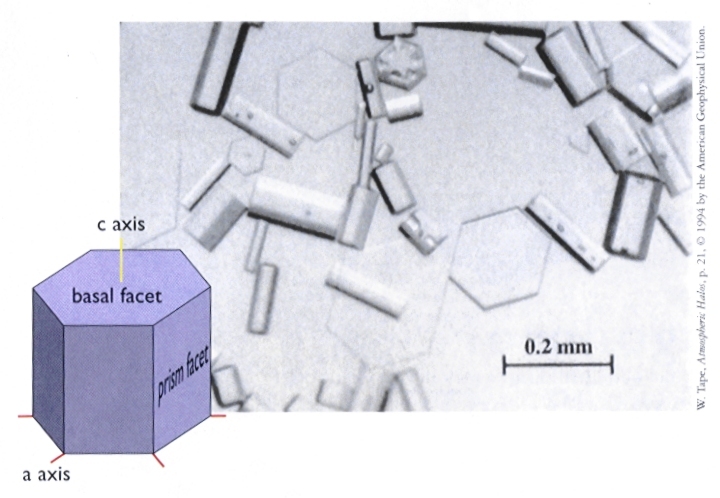 If faceting always dominated snow crystal growth, then snow crystals would always be shaped like simple hexagonal prisms. Faceting does dominate when the crystals are very small, or when the growth is very slow. 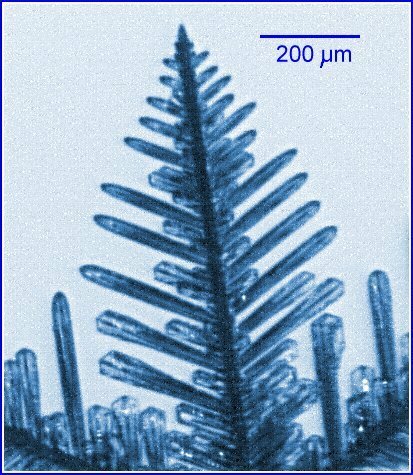 But larger crystals tend to branch out, through something called the branching instability, which is described in some detail at Snowflake Branching. Instabilities like this often produce complexity in nature -- the complex fluttering motion of a flag in the wind and the complex motion of waves breaking on the beach are other examples of instabilities in nature producing complexity. 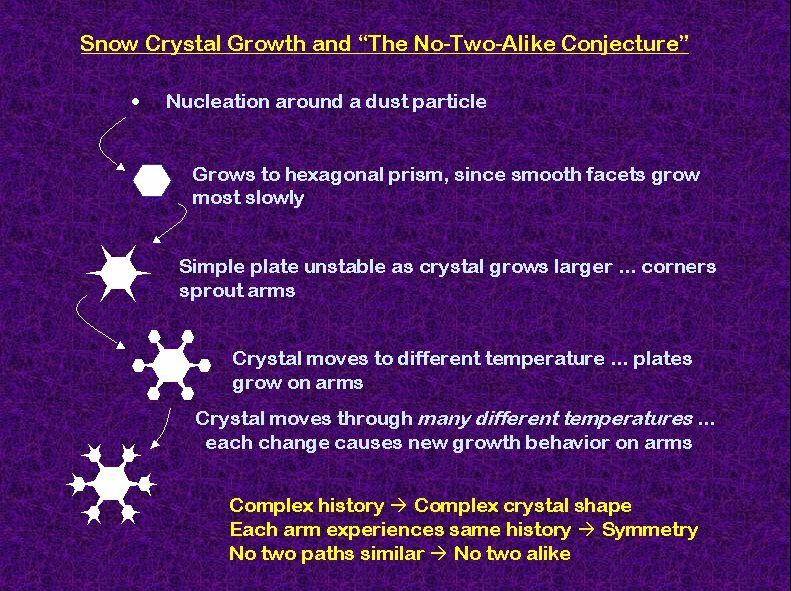 Finally, let's look at the original question by following the life story of a complex symmetrical snow crystal. The growth usually begins up in a cloud with a minute dust particle, which provides a structure on which water molecules can start condensing to form a snow crystal. When the crystal is very small, faceting dominates the growth, and the crystal quickly grows into a simple hexagonal prism. As the crystal grows larger, the corners of the hexagon stick out a bit further into the supersaturated air and thus grow a bit faster. The slightly faster growth at the corners soon causes the hexagon to sprout arms (see Snowflake Branching). And since the ambient atmospheric conditions are nearly identical across the crystal, all six budding arms grow at roughly the same rate. The temperature seen by the snow crystal is not constant in time, however, since the crystal is being blown about and is thus carried over great distances in a cloud. But the crystal growth rates depend strongly on temperature (as is seen from the morphology diagram). Thus the six arms of the snow crystals each change their growth with time, reflecting the ever-changing conditions in the cloud. And because each arm sees the same conditions, each arms grows the same way. So that's the story. The intricate shape of a single arm is determined by the ever-changing conditions experienced by the crystal as it falls. Because each arm experiences the same conditions, however, the arms tend to look alike. The end result is a large-scale, complex, six-fold symmetric snow crystal. And since snow crystals all follow slightly different paths through the clouds, individual crystals all tend to all look different. One thing you notice right away about snow crystals is that they form some elaborate and complex shapes -- often displaying lacy, branching structures. Where does this complexity come from? After all, snow crystals are nothing more than ice which has condensed from water vapor. How does the simple act of water vapor freezing into ice produce such intricate designs? The answers to these questions lie in just how water molecules travel through the air to condense onto a growing snow crystal. The water molecules have to diffuse through the air to reach the crystal, and this diffusion slows their growth. The farther water molecules have to diffuse through the air, the longer it takes them to reach the growing crystal. So consider a flat ice surface that is growing in the air. If a small bump happens to appear on the surface, then the bump sticks out a bit farther than the rest of the crystal. This means water molecules from afar can reach the bump a bit quicker than they can reach the rest of the crystal, because they don't have to diffuse quite as far. With more water molecules reaching the bump, the bump grows faster. In a short time, the bump sticks out even farther than it did before, and so it grows even faster. We call this a branching instability -- small bumps develop into large branches, and bumps on the branches become sidebranches. Complexity is born. This instability is a major player in producing the complex shapes of snow crystals. When the branching instability applies itself over and over again to a growing snow crystal, the result is called an ice dendrite. The word dendrite means "tree-like," and stellar dendrite snow crystals are common (see the Guide to Snowflakes). We can change diffusion in the lab and see how dendrites change. If one grows snow crystals in air below atmospheric pressure, they have fewer branches. This is because diffusion doesn't limit the growth so much at lower air pressures, so the branching instability is not so strong. At higher pressures, more branches appear. The growth of snow crystals depends on a balance between faceting (see Crystal Faceting) and branching. Faceting tends to make simple flat surfaces, while branching tends to make more complex structures. The interplay between faceting and branching is a delicate one, depending strongly on things like temperature and humidity. This means snow crystals can grow in many different ways, resulting in the great diversity we see in snow crystal forms.